Together, We Make Memories! - Together, We Make Memories! Everyone has a smartphone these days, and thousands of pictures commemorating priceless events that we so want to remember. But that's where it seems to stop. If there was only a way to get them all together, in one place, where they could be seen and enjoyed every day. Esprit Decor to the rescue. 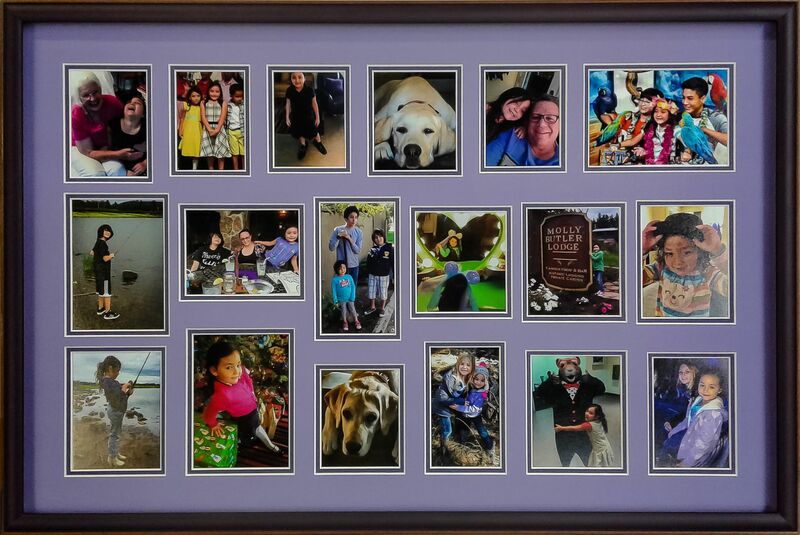 Custom printing and Montage framing happens to be one of our specialties! Bring us that shoebox, send us the links, bring in a thumb drive or DVD. We can compose, edit, touchup, restore, and print all those wonderful images that mean so much to you but are buried who knows where. You don't even have to arrange them, unless you want to. You can pick the mats, or leave it to us. We've made thousands, and we know our stuff. Then just sit back and bask in the glory. You deserve it, after all, you did the heavy lifting, deciding which images to pick. If you need suggestions, we're here to help. And, if you need multiple copies for different family members, we'll make one for everyone you choose. Chances are, this may be something you've been meaning to do for years, but never got around to. Now is the time to act, because all you have to do is mention this post and you'll get 20% off any montage framing, from now through the end of May, 2017. See you soon!